Saturday, October 13, 2018 – 10:00 a.m. to 4:00 p.m.
Join us for a one-day intensive writing master class with award-winning author Kim Stanley Robinson. Robinson will cover techniques used in writing science fiction, with an emphasis on literary technique (rather than marketing or career management), but Robinson is willing to discuss anything. Students are encouraged to bring along questions as the workshop will be completely interactive. Kim Stanley Robinson is an American science fiction writer, and a Locus reader since 1976. He is the author of more than 20 books, including the international bestselling Mars trilogy: Red Mars, Green Mars, Blue Mars, and more recently New York 2140, Aurora, Shaman, Green Earth, and 2312, which was a New York Timesbestseller nominated for all seven of the major science fiction awards—a first for any book. He was sent to the Antarctic by the US National Science Foundation’s Antarctic Artists and Writers’ Program in 1995, and returned in their Antarctic media program in 2016. In 2008 he was named a “Hero of the Environment” by Time magazine, and he works with the Sierra Nevada Research Institute, the Clarion Writers’ Workshop, and UC San Diego’s Arthur C. Clarke Center for Human Imagination. His work has been translated into 25 languages, and won a dozen awards in five countries, including the Hugo, Nebula, Locus, and World Fantasy awards. 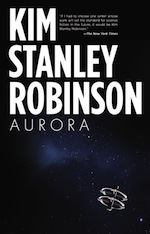 In 2016 he was given the Heinlein Award for lifetime achievement in science fiction, and asteroid 72432 was named “Kimrobinson.” In 2017 he was given the Arthur C. Clarke Award for Imagination in Service to Society.